Since the financial crisis, we have seen an unprecedented stagnation/decline in real wages. This decline has been most noticeable for low-income workers, with growing levels of inequality. The decline/stagnation in real wages is a global phenomenon – though some countries have been more affected than others. A decline in trade union membership. Increased labour market flexibility, such as more zero hour contracts, new gig economy and limited bargaining power of workers. Increased inequality with a relatively higher share of GDP growth going to pensions and company profit rather than wages. A decline in productivity growth, leading to lower economic growth and lower scope for wage growth. Net migration has been suggested as a reason for low wage growth, especially for unskilled workers. Median real wage growth has stagnated in the US before the global financial crisis. 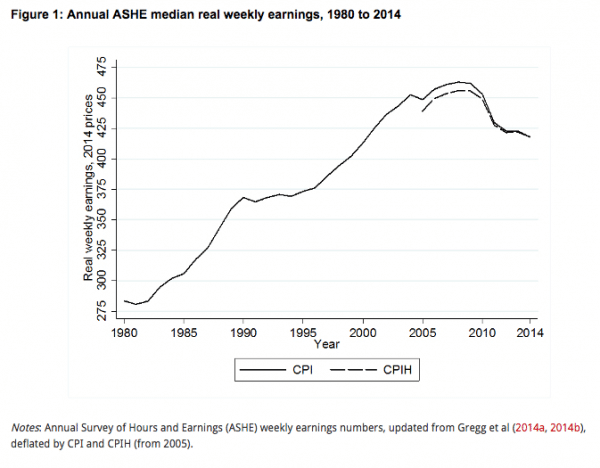 The UK experienced strong real wage growth in the 1980s and 90s but has experienced sharp falls since 2008. 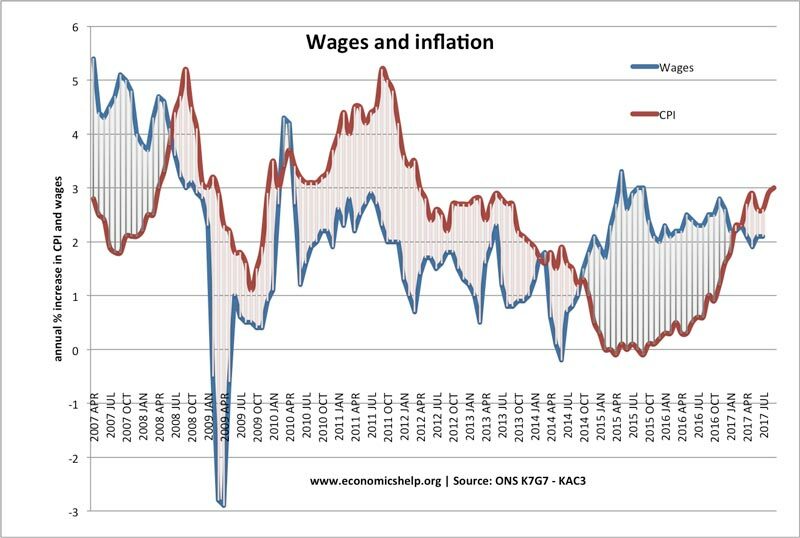 UK wage growth and CPI inflation since 2007. 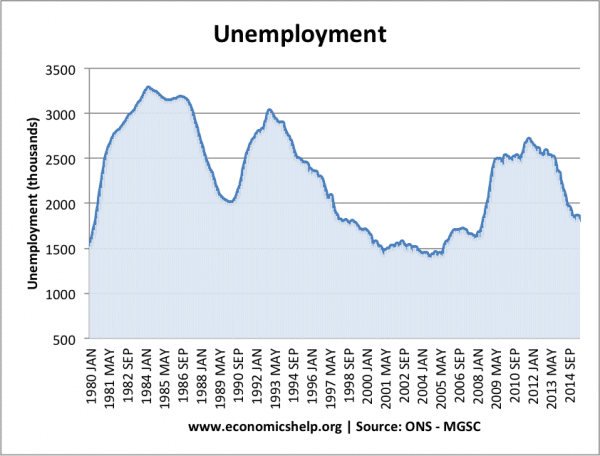 The recession of 2009 and subsequent rise in unemployment is a partial reason to explain falling wages. With less demand for workers, there is downward pressure on wages. It is quite usual for wages to fall during recessions, however, compared to previous recessions of 1981 and 1991, the fall in wages is much sharper and prolonged. Also, the fall in unemployment since 2012, did not see a corresponding recovery in real wages. One reason suggested is that falling real wages are actually a reason why unemployment has fallen quicker than previous recessions. With greater wage flexibility firms have been able to increase employment by offering lower wages. Since the early 1980s, labour markets have seen many changes. All these changes increase flexibility in wage setting and diminish the influence of workers to bargain for higher wages. Many of these labour market changes occurred in the US before the UK, which might explain low median US wage growth in the 1980s. The rise in manufacturing productivity – more produced with fewer workers. A shift in comparative advantage has seen many manufacturing processes move to China and Asia. The decline in well paid, unionised manual work has harmed the prospects for unskilled workers – often male. There are new jobs in the service sector – transport, retail, but these are often poorly paid in comparison. With stagnant labour productivity, it is no surprise firms have been unwilling to raise wages. 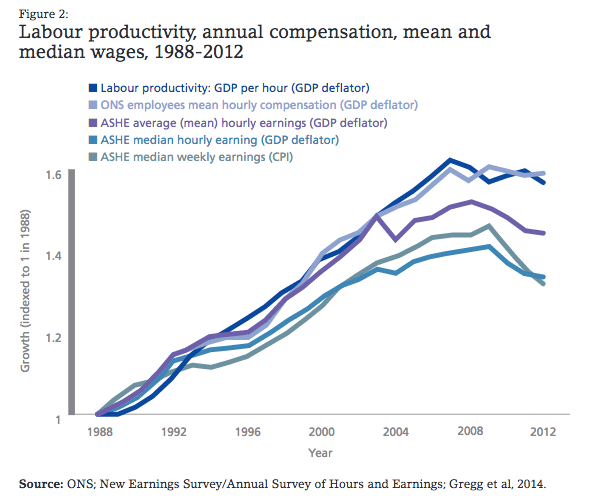 It is rising labour productivity that can cause firms to pay higher wages. The gap between productivity and wages has not led to a higher investment in the UK still experiencing relatively low levels of investment. 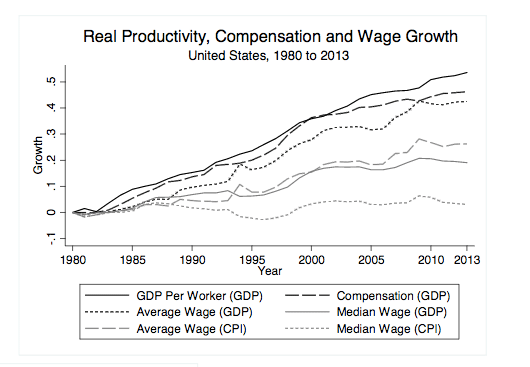 US average wages (mean) have performed better than median wages (workers in 50th decile). This is because the top 1% paid workers have seen good wage growth – this pushes up average (mean) wages, but doesn’t increase the pay for median workers. In a period of falling real wages, scrutiny is often placed on levels of net migration. 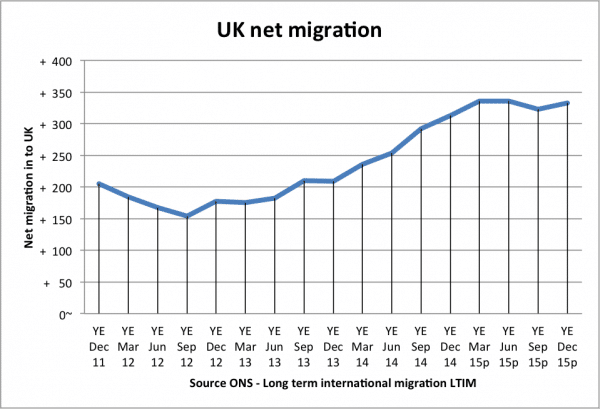 In the last decade, the UK has seen record levels of net migration, with approximately 50% coming from the EU. 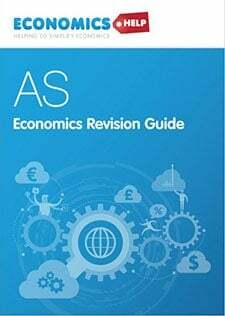 It has been suggested net migration from lower-income countries, puts downward pressure on UK wages, especially for unskilled workers. According to NIESR, the impact of immigration on wages is marginal. The impact of immigration on wages is laden with political significance. 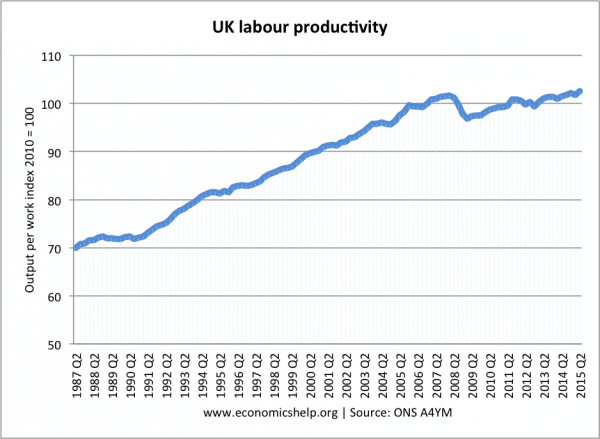 Especially since immigration is often a more visible factor than poor productivity and labour market changes. However, although the years 2008 onwards have seen falling wage growth, there have also been many other times when high levels of immigration have been consistent with rising wages – e.g. 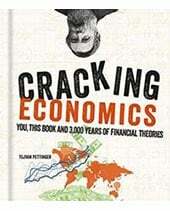 the early 2000s until the credit crisis. Several factors are responsible for falling wages – not just in the UK, but across the developed world. 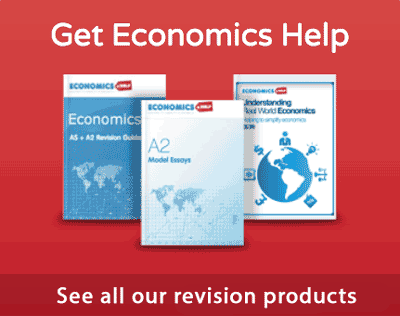 Most convincing is poor productivity and changes in labour markets leading to greater wage flexibility. Also, growing inequality is a major issue, making low wage growth more problematic as the low-paid see others in society gaining an increasing share. Unfortunately, many of the structural factors behind low wage growth show no sign of immediate change – meaning low wage growth could continue for a significant time. This low wage growth is also more problematic when combined with rising living costs – especially housing for young people. This entry was posted in labour markets. Bookmark the permalink. You’re forgetting the Fed. The Fed raises rates to specifically inhibit demand. What does that mean? Well, the demand is demand for labor and real assets. In short, they’re preventing demand for YOU. The last two Fed rate increases: December 2016, Inflation was at a tame 1.6%. Inflation in December 2015: an even tamer 0.73%. This is banking cartel action against the US. It is clear that Trump exploited this factor during his election campaign. 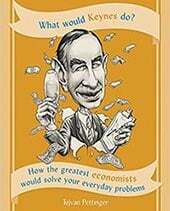 The problem is how will he improve wages in the US? The above points suggest that he has very little room for maneuver. Really interesting analysis. 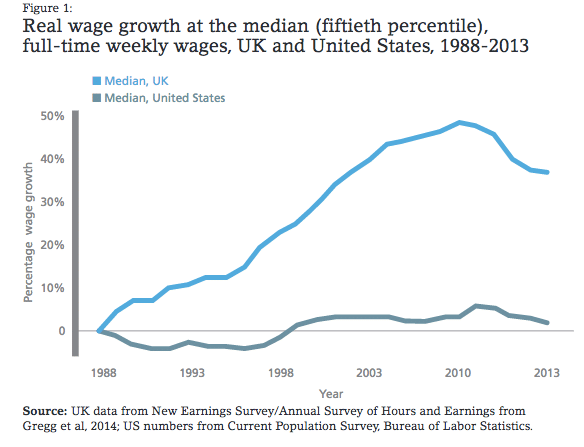 It would also be interesting to understand the impact in the UK as per the analysis made in the US – US average wages (mean) have performed better than median wages (workers in 50th decile). 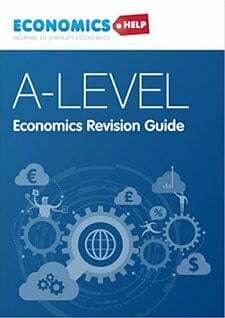 Would be great if you can point me to the source of this analysis specific to the UK if available.